William Le Baron Jenney (1832-1907) is most remembered as designing the first steel framed skyscraper thanks to his design of the Home Insurance Building (1884) in Chicago. However, 15 years before that ground breaking achievement, Jenney was involved in another pioneering activity, the planned community of Riverside, Illinois. A native of Massachusetts, William Le Baron Jenney (1832-1907) served as an engineer in the Civil War, where he designed fortifications at Corinth, Shiloh, and Vicksburg. He came to Chicago in 1867, forming the firm of Jenney, Schermerhorn and Bogart. 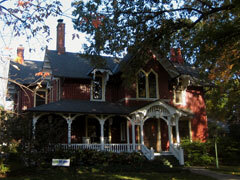 Together with landscape architects Frederick Law Olmsted and Calvert Vaux, Jenney’s firm helped develop Riverside, Illinois, the nation’s first planned “railroad suburb.” Jenney also was involved in the planning of Chicago’s extensive boulevard system, most notably Douglas, Garfield, and Humboldt parks. 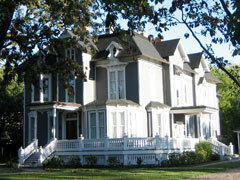 A National Historic Landmark, Riverside, Illinois’ unique look is often credited to Frederick Law Olmsted, who was hired in the fall of 1868 to design a suburb with the conveniences of the city with the beauty of the country. Yet, by spring of 1870, it was William Le Baron Jenney that would oversee the completion of Olmsted’s vision, as Olmsted’s firm resigned from the project. As superintendent, Jenney would go on to design the town’s hotel and many of the first homes (including his own). Jenney is best known for his role in the development of the steel-framed skyscraper, in such designs as the Leiter I Building (1879; demolished), the Home Insurance Building (1884; demolished), and the Leiter II, Ludington and Manhattan buildings. Jenney’s architectural office was a well-known training ground for young architects, including Daniel H. Burnham, William Holabird, and Louis Sullivan.